I have been on the forum for a little over a month and thought I should introduce myself. I was originally looking for a Boxster for a friend of mine, but he decided to put off buying till next year. I had already found this green 2000 5-speed and it was too good of a deal, so I ended up buying it for myself! 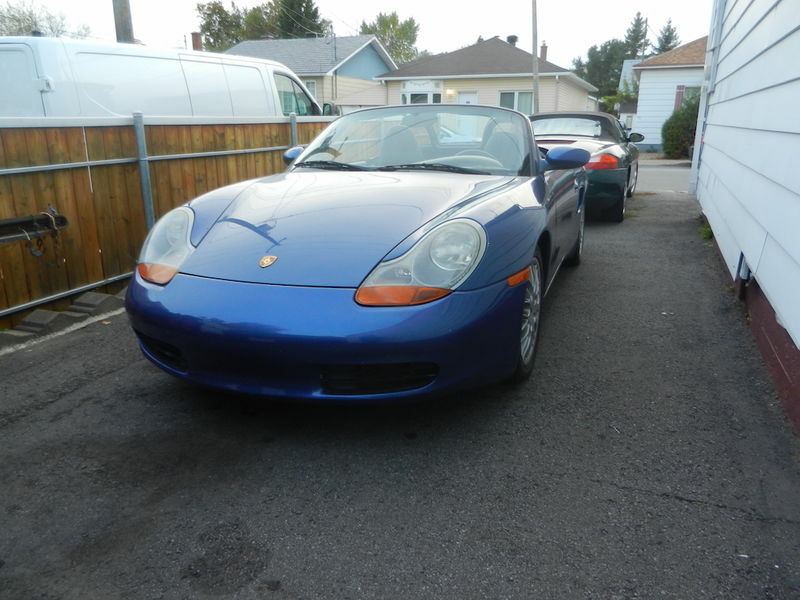 It was the cheapest Boxster that I saw in Canada over the couple of weeks that I was looking, and went from $7000 to $6500 while I was thinking about it! It is a 2000 5-speed with 135,000KM (84,000 mi). On the 50 kilometer run home it ran really nicely, no strange noises; clutch, brakes, transmission and engine all seemed fine. As usual I did not get a PPI before buying. First thing I did was to change the oil and filter and carefully inspect the old filter, seems to be fine. This is a early 2000 build (January) so I hope it has the double row IMS bearing. The clutch and brakes were supposedly done 4 years ago and it has supposedly only done a few thousand kilometers since. No records or documentation of course. Although it ran really well and seemed basically in good shape it is amazing the amount of maintenance that was not done. My aim was to get the maintenance up to date so that I could follow normal service intervals. 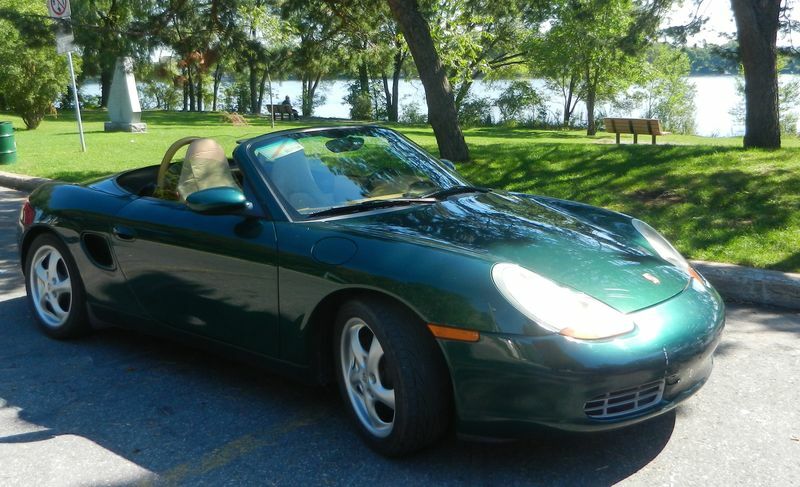 But my friend fell in love with the green Boxster so I agreed to sell it to him, despite the fact that I really liked it. So I started looking on Kijiji (like craigslist, but better, here in Canada) and I found another Boxster at a bargain price... and I bought it. It is a very nice blue and is also a 2000 5-speed. The ad said that there was an overheating problem, ever since the water pump was changed. I did some research and thought perhaps he just didn't know how to bleed the system. I spent a couple of hours going over the car and got it running (hadn't been started for several months and hadn't been driven in about 2 years because the seller had moved out of town). The coolant reservoir was empty so I put in about 6 liters of ionized water to fill it. No leaks visible. ??? Decided to take a chance, since what I paid was a couple of thousand dollars under the going price. For the short drive home, after a difficult startup, it ran well and the temperature stayed right in the middle all the way. Once here I checked the reservoir again and had to add another couple of liters of water! So I figure the guy filled the reservoir after changing the water pump and drove off without bleeding or refilling and then couldn't understand why it overheated. The previous owner claimed that he stopped the engine as soon as he saw it was starting to overheat and didn't drive it with the temperature too high. So I may have got a great deal if the engine continues to run like it does now. The car has 185,000 km vs 135,000 for the green one and the difference shows, it is not as responsive, second gear complains slightly if I shift too fast... but the interior is in very good shape. The other thing I found out at the last minute was that is a salvage title, accident on the front left corner. I thought about backing out, but decided to go ahead. The drive home didn't uncover any glaring faults. This car seems to have a longer options list... but the hood was replaced so the sticker is gone; it has electric seats and speakers in the rear. The paint is good, likely because it was repainted about 4 years ago when the accident damage was repaired, and I like the colour. It also has nice after market wheels and good tires. I haven’t driven it very far yet, but this evening I did a half-hour run to see how the engine runs and if there is any overheating. Runs well and stays right in the middle of the temperature gauge. The car will go into my garage as soon as I finish the clutch on my 924S and I get to redo all the maintenance that I just completed on the green car.